Why Do El Niño and La Niña Events Peak in Boreal Winter? | Watts Up With That? In December 2012, I had begun a series of posts about El Niño-Southern Oscillation (ENSO). This post starts the return to them. El Niño and La Niña events typically peak in strength in December and January. Refer to Figure Intro-1. It’s a graph of the weekly sea surface temperature anomalies for the NINO3.4 region of the eastern equatorial Pacific, starting in 1990. The sea surface temperature anomalies of the NINO3.4 region are an often-used index of the frequency, strength and duration of the El Niño and La Niña events. The El Niño events appear as the large upward spikes (warmings) in the sea surface temperature anomalies, and La Niñas show themselves as the downward spikes (coolings). As you’ll note, they normally peak in December and January. This post addresses why they peak at that time. 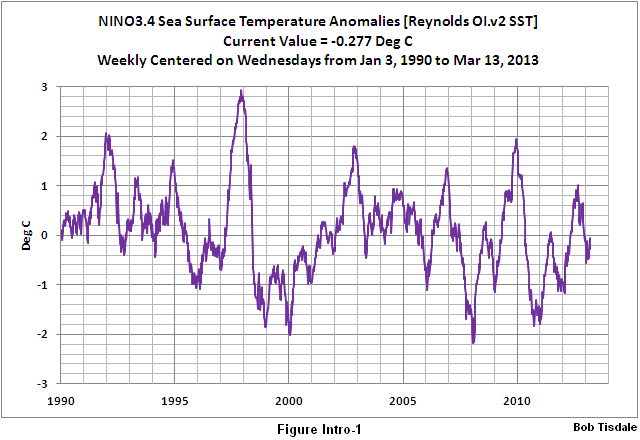 But in order to show it, we have to discuss sea surface temperatures, not anomalies. Keep that in mind, please. Also you’ll note there is a difference in the annual cycles of the sea surface temperatures in the eastern and western equatorial Pacific in Figure 4-40. The two cycles per year in the western equatorial Pacific are of course due to the fact that the Sun crosses the equator twice annually. The reasons for single cycle in the eastern equatorial Pacific are still being debated. A good overview of the proposed reasons can be found in the introduction to Wang and Wang (1999). The following discussion is Chapter 4.7 of my book Who Turned on the Heat? We’ll discuss and present what is called the “phase locking” of ENSO events to the seasonal cycle in this chapter. The sea surface temperature anomalies of the NINO3.4 region are warmest in December during a typical El Niño and coolest in December during a typical La Niña. That is, El Niño and La Niña events normally peak in December. 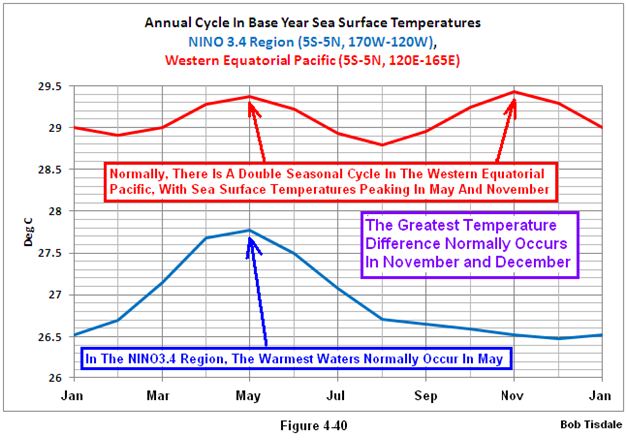 Let’s look at the normal annual cycle in sea surface temperatures (not anomalies) of the NINO3.4 region (5S-5N, 170W-120E) and the Western Equatorial Pacific (5S-5N, 120E-165E). See Figure 4-40. You’ll notice in the title block that the graph shows the cycle in the “base year” temperatures that are used to determine anomalies. As you’ll recall, that base period data is the average of 30 years of sea surface temperatures for a specific region. NOAA uses the base period of 1971 to 2000. Basically, those two curves show the average annual cycles in sea surface temperatures for those two regions for that 30-year time period. In the NINO3.4 region, the annual cycle for the average year peaks in May and the lowest temperature normally appears in December. The Western Equatorial Pacific, on the other hand, has a double cycle annually, with the warmest waters appearing there in May and November, with November winning by a nose. The sea surface temperature minimums for the Western Equatorial Pacific occur in February and August. The greatest difference between the two curves occurs in November and December. Let’s recall our ENSO basics. During an El Niño, the NINO3.4 region is being fed warm water from the west Pacific Warm Pool; that is, the Equatorial Counter Current strengthens and carries warm water eastward. As a result, the normal annual sea surface temperature cycle in the NINO3.4 region is now being influenced by the annual cycle of the sea surface temperatures in the West Pacific Warm Pool. This is easily seen in Figure 4-41. It compares NINO3.4 sea surface temperatures (not anomalies) for the period of January1995 to January 2005 and also the series of base year cycles in the sea surface temperatures for the Western Equatorial Pacific (5S-5N, 120E-165E) and the NINO3.4 region. Also note that the La Niña events reach their lowest temperatures in December-January, which is another example of how a La Niña event is simply an exaggeration of an ENSO-neutral (average) phase. The seasonal warming of the cold tongue in the early part of the calendar year (January–April) favors the initial growth of an event. The NINO3.4 region captures the western portion of the cold tongue, so the annual cycle in NINO3.4 sea surface temperatures shown in Figure 4.40 above confirms the seasonal warming of the cold tongue region in the early part of the year. The warm surface waters returning in the western basin from the Northern to the Southern Hemisphere toward the end of the calendar year (November– January) favor the demise of ongoing El Niño events. The sun passes over the equator twice during the year, at the March and September equinoxes. As shown above in Figure 4-40, the sea surface temperatures in the western equatorial Pacific reach their maximums a few months later in May and November. 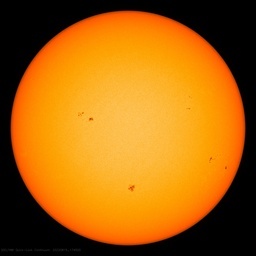 The warm water is basically following the sun, with a lag, as it progresses between hemispheres. 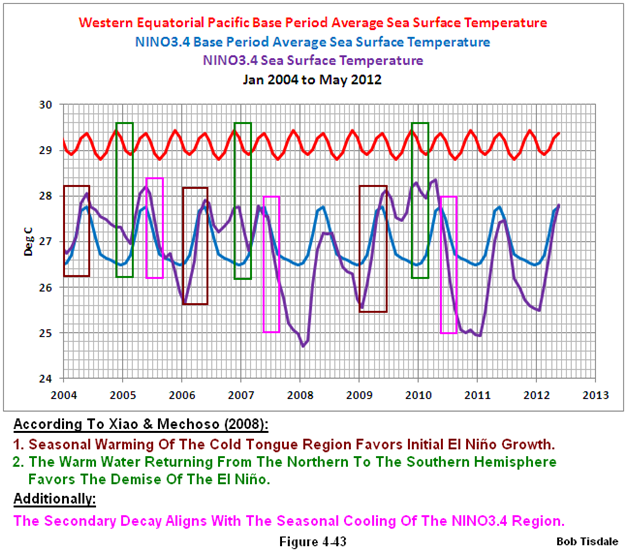 As Xiao and Mechoso (2008) describe, and to put it into terms of the data we’ve presented, the El Niño ebbs as the warm water passes from the western equatorial Pacific into the Southern Hemisphere. Figure 4-42 presents the same data as Figure 4-41. The two graphs are the same, but the notes are different. I’ve highlighted the evolutions of the 1997/98 and 2002/03 El Niño events in maroon in Figure 4-42 to show that the El Niño events do grow during the normal seasonal upswing in NINO3.4 sea surface temperatures. I’ve also highlighted in green the initial decreases in sea surface temperatures that correspond to the decrease in Western Equatorial Pacific sea surface temperatures. Additionally, I’ve repeated those highlighted periods in Figure 4-43 for the period of January 2004 to May 2012 to show the evolutions and decays of the 2004/05, 2006/07 and 2009/10 El Niño events. In both illustrations, I’ve also highlighted in pink the secondary, but major, decays in the sea surface temperatures that align with the normal seasonal portion of the major drop in annual average NINO3.4 sea surface temperatures. 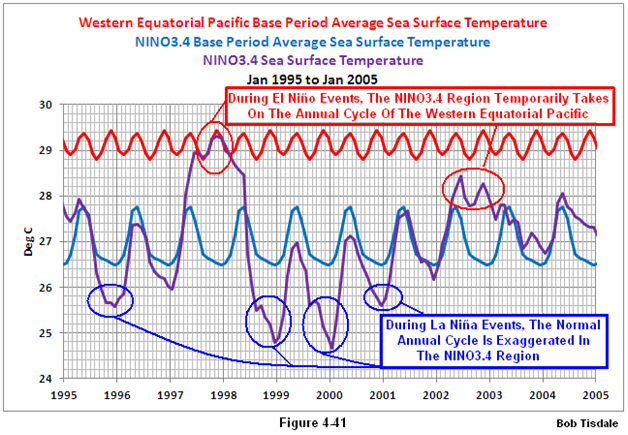 El Niño events, using NINO3.4 sea surface temperatures (not anomalies) are in phase with the seasonal cycle in the eastern tropical Pacific, the cold tongue region, for the evolution and secondary decay portions of the events. The seasonal peak and decay of the El Niño are in phase with the late year cycle in the western equatorial Pacific. La Niña events appear to simply exaggerate the normal seasonal cycle in the eastern tropical Pacific. The delayed oscillator mechanism of ENSO, Chapter 4.9, must also be considered when discussing the end of ENSO events. Why should you be interested? Sea surface temperature records indicate El Niño and La Niña events are responsible for the warming of global sea surface temperature anomalies over the past 30 years, not manmade greenhouse gases. I’ve searched sea surface temperature records for more than 4 years, and I’ve searched ocean heat content records for more than 3 years, and I can find no evidence of an anthropogenic greenhouse gas signal. That is, the data indicates the warming of the global oceans has been caused by Mother Nature, not anthropogenic greenhouse gases. Many thanks Bob, very interesting post going to take sometime to digest. However in the meanwhile do you have any thoughts on why Enso 3.4 May (“warmest water”) temps (actual) appear to be reducing? Couple of tears ago I compared Multivariant ENSO (inverted) and SOI (Southern Oscillation Index) with tectonic data in the Equatorial Pacific ( my remarks on WTWT thread ). It appears that there is some loose correlation between climatic and tectonic events, with the tectonics having the lead on the timescale. Whatever the ENSO phase the amount of energy entering the global oceans is at maximum during the southern hemisphere summer with peak insolation in late December. That is inevitable given the greater proportion of the southern hemisphere being comprised of ocean surfaces. As a result, both El Nino and La Nina events will be most affected by seasonal variations in solar input around December in each year. Furthermore, any changes in the amount of energy entering the oceans from whatever cause will have maximum effect on total energy input during the southern hemisphere summer. You’re picking up the effects of the change from a few strong El Ninos to a more placid period. Or, like the rest of the global oceans, sea surface temperatures of the eastern equatorial Pacific aren’t cooperating with the hypothesis of global warming. Yet the average sea surface temperatures for the eastern equatorial Pacific are coolest during December. Your assumptions miss a few points. “El Niño and La Niña events typically peak in strength in December and January.” jumped up from the page at me, you have said it before, but I needed this jolt. Maximum insolation is not always accompanied by maximum temperature at all locations. Interesting a “more placid period”, looks that way, lower highs and higher lows. I wonder which way it will go, which one of the red lines will be broken? Time will tell. While tectonic events might release a lot of heat is there any way to track the number and quantity of heat released by the ocean floor thermal vents? Some are quite large. Ocean floor volcanoes might be large enough to trigger a tectonic event but I’m curious as to how big an eruption would have to be to register? Are we missing a lot of smaller ones? If they are cyclic I would be very interested in any correlation, or lack thereof, to El/La events. Ocean floor volcanoes might be large enough to trigger a tectonic event but I’m curious as to how big an eruption would have to be to register? Are we missing a lot of smaller ones? If they are cyclic I would be very interested in any correlation, or lack thereof, to El/La events. Heat released by tectonic events in relation to the ocean’s heat content is by all accounts insignificant, the effect is most likely of the ocean floor movements on the balance on warm and cool currents in the small but critical areas. and the Nordic Seas currents link3 . No climate scientist the AGW or Skeptic, professional or amateur is prepared to contemplate publicly any of the above. That leaves field wide open to a few amateurs, of which it appears that I am in a minority of one. Well, the El Nino phenomena is itself specifically and deliberately named in Spanish “for” the (male) Little Boy because it was an unusual and distinct weather event that only occurred around Christmas on those years when it did happen. The El Niño events appear as the large upward spikes (warmings) in the sea surface temperature anomalies, and La Niñas show themselves as the downward spikes (coolings). Didn’t you tell us before that El Niño events were more than the upward spikes, and La Niñas were more than the downward spikes? 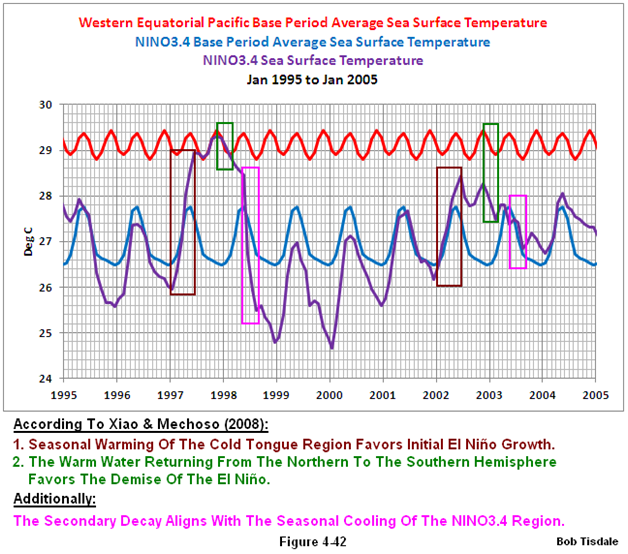 El Niño events, using NINO3.4 sea surface temperatures (not anomalies) are in phase with the seasonal cycle in the eastern tropical Pacific, the cold tongue region, for the evolution and secondary decay portions of the events. The seasonal peak and decay of the El Niño are in phase with the late year cycle in the western equatorial Pacific. That’s cool. Did you not previously write that El Niño and La Niña were independent of the ocean temperature cycle? I think that you chastised me for suggesting the approximate synchrony. Yes, I did. Thanks for recalling. I was simply identifying them in that graph. I’ll have to add a short note to confirm that. I don’t recall doing so. Do you have a link? Certainly the TSI is about 7% higher as the earth is closer to the sun in the SH summer. But also far more energy is entering the oceans as the sun’s rays are far more direct over an area of the planet with far more water, the SH. So even if the TSI was not higher, which it is, the oceans are recieving a great deal more energy. A significant amount of that energy, relevant to said energies residence time in the ocean, penetrates deep, up to 800′, and I am not certain how long it takes to get to the surface. To my simple mind, for the cause of 2 annual cycles look at the equator where the sun crosses twice, as you say; for the cause of 1 annual cycle, look away from the equator, where the sun crosses once. The S Pacific is much larger than the N Pacific, so is the obvious place to look. The ocean current in the S Pacific runs anti-clockwise. This current reaches the E tropics first, so this is where the annual cycle could be expected to be strongest. And it is. By the time the current gets across to the W tropics, the half-annual cycle has taken over. If the idea that the S Pacific current drives the annual cycle is correct, then the double cycle in the W could be expected to be asymmetrical, because at least some of the annual cycle would still be there. And it is – inspection of your graph (Figure 4-41) shows this to be the case. ENSO’s Phase Locking to the Seasonal Cycle in the Fast-SST, Fast-Wave, and Mixed-Mode Regimes. Eli Galanti and Eli Tziperman, 2000, J. Atmos. Sci., 57, 2936–2950. The physical mechanism underlying ENSO’s phase locking to the seasonal cycle is examined in three parameter regimes: the fast-SST limit, the fast-wave limit, and the mixed SST–wave dynamics regime. The seasonal cycle is imposed on simple ordinary differential equation models for each physical regime either as a seasonal ocean–atmosphere coupling strength obtained from the model of Zebiak and Cane or as a climatological seasonal upwelling. In all three parameter regimes, the seasonal variations in the ocean–atmosphere coupling strength force the events to peak toward the end of the calendar year, whereas the effect of upwelling is shown to be less important. The phase locking mechanism in the mixed-mode and fast-SST regimes relies on the seasonal excitation of the Kelvin and the Rossby waves by wind stress anomalies in the central Pacific basin. The peak time of the events is set by the dynamics to allow a balance between the warming and cooling trends due to downwelling Kelvin and upwelling Rossby waves. This balance is obtained because the warming trend due to the large-amplitude Kelvin waves, amplified by a weak Northern Hemisphere wintertime ocean–atmosphere coupling strength, balances the cooling trend due to weak Rossby waves, amplified by a strong summertime coupling strength. The difference between the locking mechanisms in the mixed-mode regime and in the fast-SST regime is used to understand the effect of the SST adjustment time on the timing of the phase locking. Finally, in the less realistic fast-wave regime, a different physical mechanism for ENSO’s phase locking is revealed through the SST adjustment time and the interaction between the east Pacific region and the central Pacific region. Corresponding author address: Dr. Eli Galanti, Dept. of Environmental Sciences, The Weizmann Institute of Science, Rohovot 76100, Israel. A series of NINO3.4 SST (small) summer peaks marks a warming trend of NINO3.4 SSTs. A series of NINO3.4 SST (large) winter peaks marks a cooling trend of NINO3.4 SSTs. The pileup of warm water at the restriction of Indonesia happens from both hemispheres. It’s like kneeling at the beach and scooping sand into your tummy with both hands. Seasonally, one hand gets tired, and then the other, and maybe you scoot sideways back and forth, but your tummy (Indonesia) is always in the way. All the index rectangles do is tell us when the trades (your arms) are taking a break and the warm water is backsliding. The Kelvin, Rossby, and ? yet to be identified waves seem pretty marginal until they hit some harmonic. The warm pool pileup prior to El Nino should be the time of highest leakage of warm water through Indonesia into the Indian Ocean, but it is not. Most warm water is pushed through by a reaction wave after the Nino is well under way. The 1997 Nino was remarkable because this reaction and slosh through Indonesia seemed to cause a secondary Nino like event in the Indian Ocean. Oh yeah, and the reason the eastern Pacific does not show the bimodal seasonal pattern is because the surface waters are continually exiting stage left. Prediction: eastern Pacific bimodality is more pronounced during Ninos. Back to the beach, PDO is when a weight is placed on one arm and a jet pack on the other. A quick ‘find’ for ‘moon’ found nothing mentioned in the article or comments so far. Is there no role for the lunar tidal force in this process? Tides change over the course of a year (they are not constant day to day or month to month) ‘tidal mixing’ is about as important as winds for mixing surface water and deeper cold water. There are many cycles to the tides, some rather long, so I think it could explain some of the longer cycles of comings and goings of ENSO / PDO / etc. events. If there’s any influence, I don’t recall it being mentioned in any paper I’ve ever read. The Rossby waves in the Indian Ocean that occurred during the 1997/98 El Niño show up well in the following animation, starting near the time mark of 0:44. Do those waves initiate in the Pacific or the Indian Ocean, gymnosperm? To me, they do not appear to be carrying warm water from the Pacific to the Indian Oceans–that is, they appear to be reactions within the Indian Ocean. A bit of an encouragement for sky gazers. Bob Tisdale said in response: If there’s any influence, I don’t recall it being mentioned in any paper I’ve ever read. 1. Wilson I.R.G. and Sidorenkov N.S., Long-Term Lunar Atmospheric Tides in the Southern Hemisphere, Open Atmospheric Science Journal, 2013, in press. A bit disappointed, considering the fact that I read almost all of your articles. Ian, many appreciate your work and comments. Bob has a different role to play. Tim Channon suggests 8.9a where Ballester+ (2005) found 8.65a. Reminder: Dickey & Keppenne (1997) found 54 month in ENSO (along with QBO). One’s perception can be deceiving. I do believe we need to spend more time just watching, but I often test my perception by watching the Isthmus of Panama. Sometimes you could swear there is flow through there but unless you believe in underground channels you know it is just the wind. Bob Tisdale: I don’t recall doing so. Do you have a link? I’ll go with what you have provided in this post.